For this year 2016, the ice skating rink at Yeouido Park was opened last December 9, 2016. It will be operating until mid February next year. After a failed attempt to try ice skating in Korea last Chinese New Year, we made sure to really try it this winter, so at the second day of its opening, we went to the Yeouido Park to scrape the ice, I mean to skate! We arrived a little late in the venue, we started at around 12 noon and there were few people skating, mostly kids. 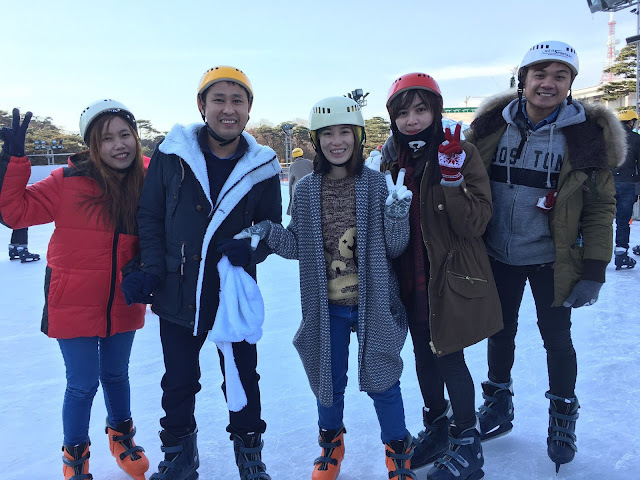 As first timers, we hesitated a little bit, but the weather was good, it was not too cold and the atmosphere was inviting us to have some fun, so we excitedly grabbed our ice skates at the rental booths. The ticket for the ice skating rink is only 2,000 won and it includes rental of the ice skates. After we got our ice skates, we went to the locker booths to leave our bags and shoes. The locker booths only costs 500 won, the person in charge for the keys of the locker collected 1,000 won for every key. He promised to return the extra 500 won when we return the key. It was not crowded that day; it was not difficult for us to change our shoes into ice skates. The difficult part though was on making ourselves comfortable wearing the ice skates. At the entrance of the skating rink, there's a box full of safety helmets; we scavenged for the helmet that perfectly fits our respective heads. When we entered the rink, we don't know what to do. Instead of skating, we were scraping the ice off the floor with our ice skates. It was our first time, so it’s like walking in the dark alley. You know how it feels to walk in the dark, where you see nothing and you walk so careful just to make sure you won’t hit on something, that’s exactly how I felt like when I first stepped into the rink. With a little help from a friend who knows how to skate, I gradually got the hang of it and I just found myself enjoying it. I like how organized they are in the skating rink. People go into one direction to avoid bumping into each other. There are personnel in charged to make sure people are following the one direction rule. They also make sure that everybody’s safe, and they always come to the rescue to people who lost their balance. For people who want to practice and control their balance, the rink boundary which is a glass wall can be used as a bar. You can hold on to it while you walk on the ice until you find your balance. If you are too tired or afraid to stand up on ice, there are benches inside the rink where people can sit down. The skating rink is big enough to accommodate up to 500 people. If you are searching for some adventure this winter in Korea, why not try ice skating at the Yeouido Hangang Park. Aside from ice skating, they will also install a sledding hill and a snow playground for everybody to enjoy. It’s a one stop park to enjoy winter activities in Korea. To go to the Yeouido Hangang Park Ice Skating rink, get off at Yeouido Station on Seoul Subway Line Number 5, go to Exit 3 and walk straight for about 5 minutes to the Yeouido Park.